Science Discussion Forum / Re: "Googol"
Thanks for the information but Please see the google History for your information. Google began in March 1996 as a research project by Larry Page and Sergey Brin, Ph.D. students at Stanford working on the Stanford Digital Library Project (SDLP). The SDLP's goal was “to develop the enabling technologies for a single, integrated and universal digital library" and was funded through the National Science Foundation among other federal agencies. In search for a dissertation theme, Page considered—among other things—exploring the mathematical properties of the World Wide Web, understanding its link structure as a huge graph. His supervisor Terry Winograd encouraged him to pick this idea (which Page later recalled as "the best advice I ever got") and Page focused on the problem of finding out which web pages link to a given page, considering the number and nature of such backlinks to be valuable information about that page (with the role of citations in academic publishing in mind). In his research project, nicknamed "BackRub", he was soon joined by Sergey Brin, a fellow Stanford Ph.D. student supported by a National Science Foundation Graduate Fellowship. Brin was already a close friend, whom Page had first met in the summer of 1995 in a group of potential new students which Brin had volunteered to show around the campus. Page's web crawler began exploring the web in March 1996, setting out from Page's own Stanford home page as its only starting point. To convert the backlink data that it gathered into a measure of importance for a given web page, Brin and Page developed the PageRank algorithm. Analyzing BackRub's output—which, for a given URL, consisted of a list of backlinks ranked by importance—it occurred to them that a search engine based on PageRank would produce better results than existing techniques (existing search engines at the time essentially ranked results according to how many times the search term appeared on a page). A small search engine called "RankDex" from IDD Information Services (a subsidiary of Dow Jones) designed by Robin Li was, since 1996, already exploring a similar strategy for site-scoring and page ranking. The technology in RankDex would be patented and used later when Li founded Baidu in China. BackRub is written in Java and Python and runs on several Sun Ultras and Intel Pentiums running Linux. The primary database is kept on an Sun Ultra II with 28GB of disk. Scott Hassan and Alan Steremberg have provided a great deal of very talented implementation help. Sergey Brin has also been very involved and deserves many thanks. Originally the search engine used the Stanford website with the domain google.stanford.edu. The domain google.com was registered on September 15, 1997. They formally incorporated their company, Google Inc., on September 4, 1998 at a friend's garage in Menlo Park, California. By the end of 1998, Google had an index of about 60 million pages. The home page was still marked "BETA", but an article in Salon.com already argued that Google's search results were better than those of competitors like Hotbot or Excite.com, and praised it for being more technologically innovative than the overloaded portal sites (like Yahoo!, Excite.com, Lycos, Netscape's Netcenter, AOL.com, Go.com and MSN.com) which at that time, during the growing dot-com bubble, were seen as "the future of the Web", especially by stock market investors. In March 1999, the company moved into offices at 165 University Avenue in Palo Alto, home to several other noted Silicon Valley technology startups. After quickly outgrowing two other sites, the company leased a complex of buildings in Mountain View at 1600 Amphitheatre Parkway from Silicon Graphics (SGI) in 2003. The company has remained at this location ever since, and the complex has since become known as the Googleplex (a play on the word googolplex, a number that is equal to 1 followed by a googol of zeros). In 2006, Google bought the property from SGI for $319 million. The Google search engine attracted a loyal following among the growing number of Internet users, who liked its simple design. In 2000, Google began selling advertisements associated with search keywords. The ads were text-based to maintain an uncluttered page design and to maximize page loading speed. Keywords were sold based on a combination of price bid and click-throughs, with bidding starting at $.05 per click. This model of selling keyword advertising was pioneered by Goto.com (later renamed Overture Services, before being acquired by Yahoo! and rebranded as Yahoo! Search Marketing). While many of its dot-com rivals failed in the new Internet marketplace, Google quietly rose in stature while generating revenue. Google's declared code of conduct is "Don't be evil", a phrase which they went so far as to include in their prospectus (aka "S-1") for their 2004 IPO, noting that "We believe strongly that in the long term, we will be better served—as shareholders and in all other ways—by a company that does good things for the world even if we forgo some short term gains." Announcements/News & Event / Re: DCCI delegation team left Dhaka to Doha to participate "World Chamber Congress"
This delegates team is the ever best and powerful team for DCCI and also for the Bangladesh to extend Business Marketing in the Global position. Wish all of the member for achive more and more connection and business for our Country Inshawallah. Good Luck. 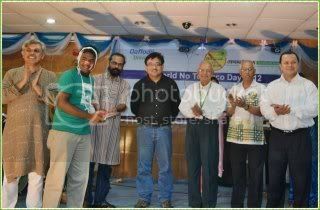 Award Giving Ceremony of "World NO Tobacco Day-2012" organized by DIU Prothom Alo Bondhu Shava and Daffodil International University (DIU). Various Useful Links / Re: Useful Links of Banks in Bangladesh!! Useful Links in DIU . Have you seen the Useful Links of DIU ?